Rock.com has the most amazing collection of licensed logo band merchandise available online. They proudly support Rock artists, and only deal with vendors that supply authentic apparel and merch. At Rock.com you will find men’s and women’s t-shirts and hoodies, posters and fabric posters, infant and toddler apparel, hats and caps, backpacks and wallets, patches and magnets, stickers and buttons, wristbands and belts, jewelry and key chains, towels and blankets, guitar picks, and even shoelaces and neckties. Check back at 58Coupons.com often for the best savings, promotions and coupons for Store.Rock.com. 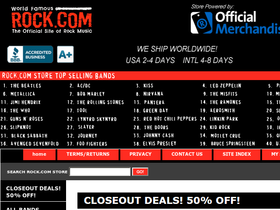 Enjoy $5 savings on orders over $20 from Rock.com when you use this code at checkout. Click link to get started. Save 5% by using this coupon code at Rock.com. Click link to shop. Get your favorite band's poster for under $10 at Store.Rock.com. Click link now. Decorate your room with your favorite bands at Rock.com. Click link to find pillowcases, towels, pillows, and blankets. Check out Store.Rock.com today for an incredibly wide selection of t-shirts of your favorite bands. Click link to buy.